Technological advancements have increased crude production from shale deposits and allowed the U.S. to become the world’s largest oil and natural gas producer. This surge in domestic production is not only driving our energy security but has also created benefits for consumers through lower fuel prices and greater job opportunities. As production in shale plays has grown, producers have relied on rail to move crude oil to refineries on the East and West Coasts. With this direct source of domestic production, imports from foreign countries into East Coast refineries have declined. Domestic deliveries from shale plays to West Coast refineries have also offset declining production in California and Alaska. Growing energy production depends on an expanding energy infrastructure network, including railroads, pipelines, trucking, and marine transportation. In North America, railroads are separated by class depending on their operating revenue. Since 2008, transportation of crude oil by the six Class I railroads, considered the largest freight rails in North America, has grown significantly from 9,500 originated carloads in 2008 to 233,698 in 2012 and almost 500,000 in 2014. Last year, railroads transported approximately 8 percent of U.S. oil production. 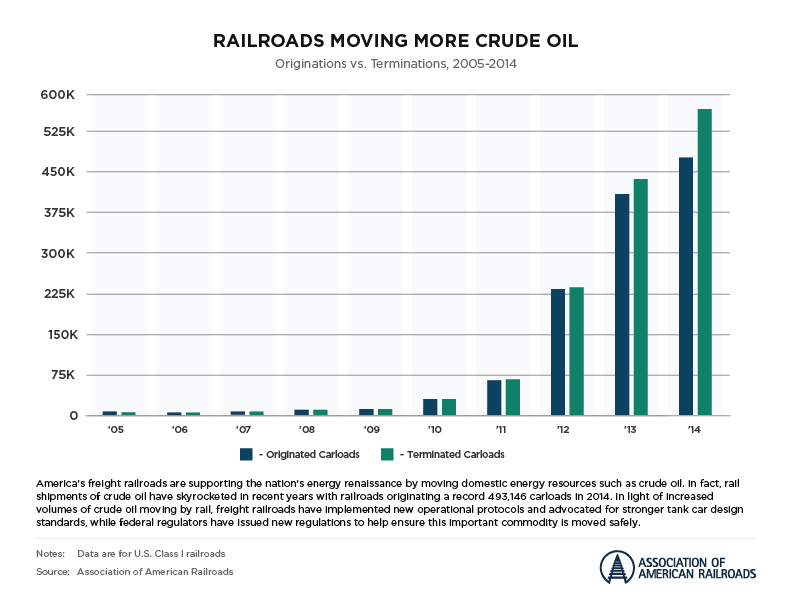 While increased pipeline capacity and refining operations may provide additional outlets for crude oil, rail will continue to serve a vital role in transporting domestic energy. To ensure the continued development of the U.S. energy renaissance, industry leaders continue to work with regulators and other stakeholders to improve the safety and reliability of energy products transported by rail.